Junior forward Rebecca Russo of Westport is off to a fast start with the Boston University women''s hockey team, which is ranked No. 4 in the nation. 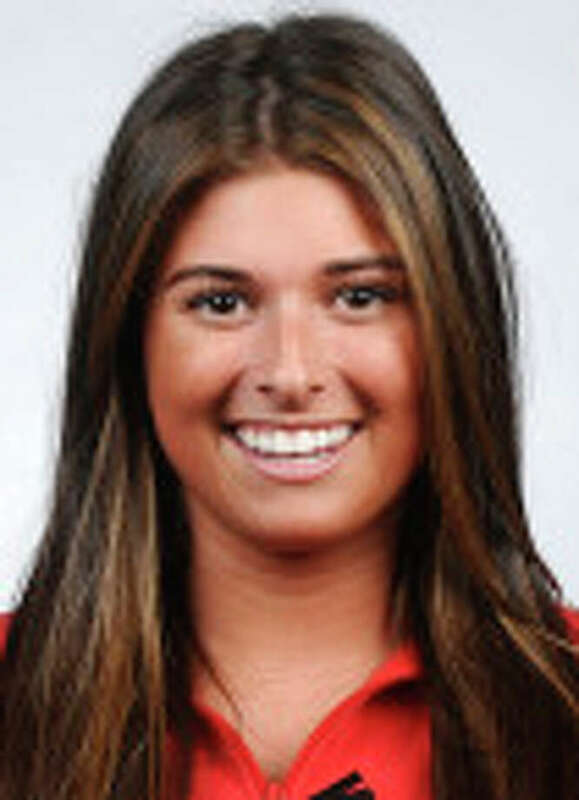 On the Boston University women's hockey roster, Rebecca Russo's hometown is listed as Westport. But that barely begins to trace the junior forward's route to the top levels of women's hockey. Between early childhood and college, Russo, 20, has had stops in New York, Fairfield, Toronto, Massachusetts and Minnesota. Her stock has risen as a result of each experience, and she has thrived in the sport she loves, regardless of location. Russo is in the midst of a breakout year for the No. 4 Terriers, tallying 13 points (six goals, seven assists) in 17 games in helping BU to a 12-3-2 record before the winter break. Russo first stepped on the ice in figure skates at age three, but after watching older brother Brandon glide around with a stick in his hand, it wasn't long before she wanted to switch to a different type of blade. "I always looked up to my brother," Russo recalled. "My parents put me on skates. I definitely wasn't digging the velvet dresses and white skates, and I grew out of that." Establishing her hockey foundation in Darien while temporarily trying other sports, Russo quickly rose to the top of her class. "I just loved hockey," Russo said. "I just fell in love with it. When I was little, I tried softball and soccer, but I instantly loved hockey." Russo's father, Peter, founded the Mid-Fairfield Stars hockey program and was its president for a number of years. He also is a 9/11 survivor, and, after the attack, he wanted to get away from the East Coast. The family moved temporarily to Toronto, and there Rebecca experienced Canadian junior hockey for a year before returning home. Russo went to Bedford Middle School and decided to go to high school just over the Massachusetts border at the Berkshire School, which has two on-campus rinks and has sent girls to some of the top Division III hockey programs and even a couple of Division I schools. But Russo, as a potential Division I prospect, during her second year at Berkshire realized she needed tougher competition and began exploring some of the nation's elite prep school programs. "My brother went to Salisbury (a prep school 20 minutes from Berkshire)," Russo said. "I always went on trips there and I fell in love with Berkshire. But eventually I needed a (greater challenge) in the hockey world." So she visited Shattuck-Saint Mary's School in Minnesota, one of the top prep hockey programs in the country. Both boys and girls teams consistently compete for national championships, and the boys team has produced numerous NHL players, including Sidney Crosby and Jonathan Toews. "I knew a couple of girls who went there from the U.S. national camp," Russo said. "I never really thought of going there, but when I told my parents I needed to go somewhere else, we looked at Shattuck. After practicing with the team and getting the tour, I wanted to go." So Russo was on the move again, this time to Fairbault, Minn., for her junior and senior years. "I was nervous going to boarding school after freshman and sophomore year," Russo said. "I got used to it, though. You're family at boarding school, and instantly I fell in love with it." While at Shattuck, Russo won a national championship as a junior and reached the final eight as a senior. Playing between 50 and 70 games a year against top competition, in addition to being on the ice almost every day, prepared Russo for what lay ahead. "When you meet her, she just has a wonderful, spirited personality," said Gordie Stafford, who coached Russo at Shattuck. "She's a cool kid. It took her a little while to develop as a junior, but she had a great senior year and has carried that to (Boston University). She's an extremely quick skater." The increased exposure at Shattuck ensured Division I programs would come calling. Russo kept a spreadsheet of schools that were interested, and once she visited Boston, she realized she wanted it to be the next step of her long hockey journey. In between college visits and high school contests, Russo was a part of the U.S. developmental team and participated in international competitions. "The first place I noticed her was at the national camp in the U.S. when she was 10th or 11th grade," Boston University coach Brian Durocher said. "She was a real high-energy skater, had offensive skills (including) shooting the puck well. She also has fast hands; they are hyper quick to go with the skating." Yet another transition was around the corner: adjusting to the speed of the college game. Russo struggled initially, notching five points in 30 games as a freshman. Additionally, an injury slowed her in a frustrating season. "Freshman year is never easy," Durocher said. "You don't get a bunch of power-play or penalty-kill time. Kids that come here are used to stuff like that sometimes." Russo saw an uptick is ice time and scoring in her sophomore campaign, notching 21 points in 38 games as the Terriers advanced to the NCAA quarterfinals. That would serve as the springboard to an excellent start to the 2014-2015 season, both personally and as a team. Durocher attributes Russo's fast start to a more rigorous training regimen -- she's worked with a personal trainer -- and the fact that she practices every day with the No. 4-ranked team in the country. "Practice is a challenge," he said. The junior has a year and a half of collegiate hockey eligibility remaining and high goals for that time. She wants to capture the Beanpot -- the fabled tournament featuring Boston's four Division I hockey schools -- and challenging for a national title. Following hockey, Russo has hopes of becoming a sports broadcaster. In her words, she would like to become the next Kim Jones, a reporter for the NFL Network who used to cover the New York Yankees. After what's she's achieved on the ice, who would bet against that? "She's very charismatic, she has high energy and is very outgoing," Durocher said. "Those are all qualities she brings 24/7 to her life to Boston University and to her team. ... It's a great part of personality; it makes her vibrant and makes her an engaging person. It's a strength that will be great in the real world."